IIG proud to announce 25th convocation program graduation and award ceremony for the batch of 2018. wherein we commending the work of about 50 students who have graduated From the International Institute Of Gemology on completion of various courses like Diamond Graduate, Gemology Graduate, Jewellery Design etc. The students were facilitated by our Guest of Honour – Mr. Rajendra Jain, MD Swarovski Gemstones – India, and Mr. Rahul Desai, MD IIG. Five students namely, Ms. Saloni Agrawal, Ms. Khyati Raju Lakhani, Mr. Asif Khan, Mr.Kashyap Patel, and Mr. Chandan Gurav won “Best Student Awards” in their respective courses. The awards given to the students were sponsored by Swarovski Gemstones and it was an achievement in itself for the students to get facilitated by them. 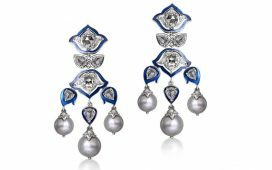 Swarovski Gemstones – India is the leading brand when it comes to Zirconia Diamonds and Gemstones. Mr. Rajendra Jain acknowledged the talent of various students at the convocation ceremony and also granted support to all the students when it comes to placements! Founded in Mumbai, the International Institute of Gemology (IIG), powered by SRDC, has been one of India’s premier gemological institutes since 1965 and is helmed by Managing Director, Mr. Rahul Desai. IIG is affiliated with the University of Mumbai, having trained 1,00,000 students since its inception. It offers practical, market-oriented training in a variety of courses on gems, diamonds, and jewellery designing and merchandising. The institute is one of the few in India to offer training in the rough diamond assortment. It is also the sole tutor of the Venus Grading System, a highly precise system of diamond grading devised by leading diamond manufacturers Venus Jewels.